Thomas Oosthuizen and Thabiso Mchunu during their first battle in September 2018. 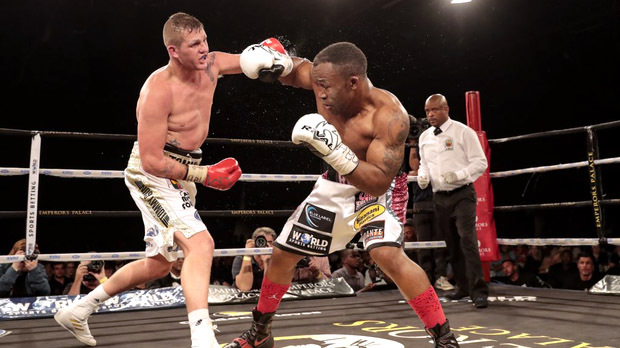 On Saturday, Thomas Oosthuizen and Thabiso Mchunu will resume their hostilities, just 98 days removed from their first epic cruiserweight battle. 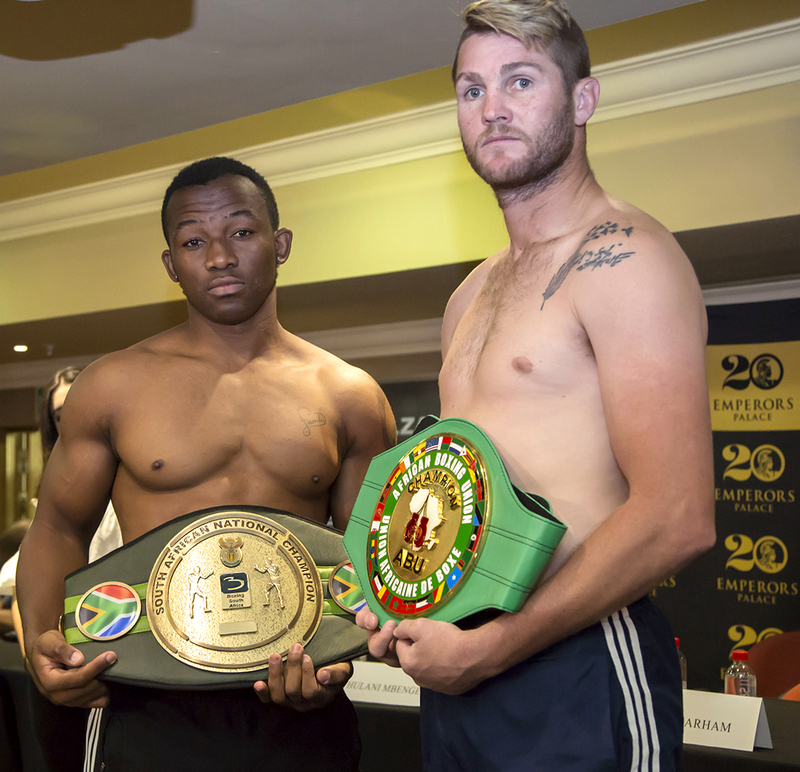 The pair will again meet at Emperors Palace in Kempton Park, South Africa, to contest for a regional title. When they fought in September, Oosthuizen (28-1-2, 16 knockouts) won a majority decision by the smallest of margins, and both teams decided to settle matters with a rematch. Oosthuizen’s career had been blighted by alcohol, drugs and a string of arrests, but thankfully, before is was too late, the now-30-year-old was able to recalibrate his life and give one of the best outings of his career. His performance was a pleasant surprise to promoter Rodney Berman of Golden Gloves. Of course it takes two to tango, and Oosthuizen needed a willing dance partner. He found one in former world title challenger Mchunu (19-5, 12 KOs). Mchunu’s form has been spotty over the past few years. 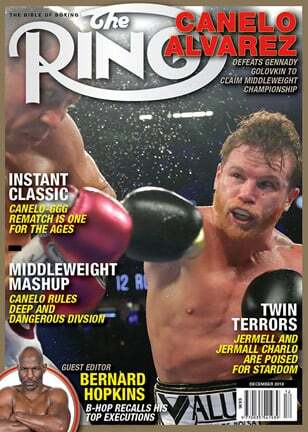 The 30-year-old has gone 4-4, but it must be noted that those losses were in good company, including undisputed cruiserweight king Alexsandr Usyk in 2016. Hall of Famer Brian Mitchell expects another compelling encounter. Both men are keen to stress they’ve enjoyed good training camps, Oosthuizen under the watchful eye of former two-time welterweight title challenger Harold Volbrecht and Mchunu with Sean Smith. “Tommy Gun” has lived with Volbrecht for the past month to minimize any distractions. The venerable boxer-turned-trainer was quick to point out that his man was on weight at Tuesday’s pre-medical while his opponent still has work to do. Unsurprisingly, both camps are confident of victory on Saturday. “I’m going to be sharper than a two-cutting blade on Saturday night,” said Oosthuizen. “I’m going to be busy and ready for anything and to dish out anything. The fight can go the distance, the fight can go the short route, but the fight’s going my way. The softspoken Mchunu is a man of few words, but retorted: “I’m expecting him to run more, but it’s going to be easy. I’m going to win this fight. Volbrecht and Smith are also confident their charges will be victorious. Smith feels his fighter can level the series. “Neutralize the flurries and the flashy bits,” said Smith. “Internationally you’re not going to get those decisions. Instead of looking at it negatively, I said to him, ‘If you go abroad you’re going to have to win more convincingly.’ So Saturday night, he’s going to win convincingly and set himself up for some big shows overseas. When former WBA/IBF junior lightweight beltholder Mitchell’s head was put on the spot with regard to who will win, he said: “[Tommy’s] coming off a win over the same opponent; you would think he can win again, but the fight game doesn’t work like that. You just don’t know which fighter’s going to win on the night. Berman feels that as long as the second installment is as riveting as the first go-around, both men have a part to play in the talent-laden 200-pound division, and he has a working plan. “I think you’re going to see a much more aggressive, fitter Tommy Oosthuizen this fight. You’re going to see Thabiso Mchunu being a lot more aggressive, not fighting in flurries and one punch at a time. Whoever’s hand is raised in victory, it’s not going to kill the career of the loser; they’ll both go on. But for boxing itself, I’m looking forward to having for the fans another outstanding fight. Oosthuizen is looking even further ahead at the top man in his division. Perhaps that’s a big ask, but after where Oosthuizen has been, write him off at your peril.